This reality conflicts with one of the excuses the US uses to engage in war – so-called ‘humanitarian wars’, which are based on the dubious legal claim that the US has a “responsibility to protect.” The United States is viewed as “the greatest threat to peace in the world today” by people around the world. Thus, USians need to organize to protect the world from the United States. The footprint of US empire are what Chalmers Johnson called an “empire of bases.” David Vine, the author of Base Nation, put US empire in context by describing 800 US bases in 80 countries and US military personnel in more than 170 countries. Bases range from so-called Lily Pad Bases of hundreds of troops to town-sized bases of tens of thousands of troops and their families. He noted many bases have schools and they do not need to worry about heating or air conditioning, unlike schools in Baltimore where parents bought space heaters to keep children warm and where schools were closed due to lack of heat. The contrast between Baltimore schools and military base schools is one example of many of the heavy price USians pay for the military. Vine reported that $150 billion is spent annually to keep US troops on bases abroad and that even a Lily Pad base could cost $1 billion. More is spent on foreign military bases than on any agency of the federal government, other than the Pentagon and Veterans Administration. The Pentagon is not transparent about the number of US foreign bases it manages or their cost. They usually publish a Base Structure Report but have not done so in several years. The Pentagon only reports 701 bases, but researchers have found many, even significant bases, not included in their list of bases. 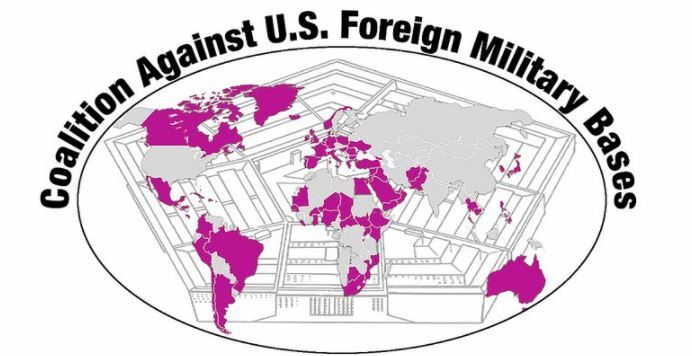 The military footprint of the United States shows it is the largest empire in world history. In our interview with historian Alfred McCoy, author of In The Shadows of the American Century, he describes how some of the key characteristics of US empire are secrecy and covert actions. This are some of the reasons why it is rare to ever hear US empire discussed in the corporate media or by politicians. McCoy told us this was true for some other empires too, and that it is often not until the empire begins to falter that their existence becomes part of the political dialogue. McCoy describes Obama as one of three “Grandmasters of the Great Game” (the other two being Zbigniew Brzezinski, President Carter’s National Security Adviser, and Elihu Root, former Secretary of War and Secretary of State at the beginning of the 20th Century) who excelled in being strategic on behalf of US empire. In addition to trade agreements and the Asian Pivot, Obama built on the intelligence apparatus of the George W. Bush era. Even though Obama was a “grandmaster,” he did not slow the weakening of US empire. McCoy sees the inability to account for the unpredictable complexities of US and global political developments as a common weakness of empire strategists. 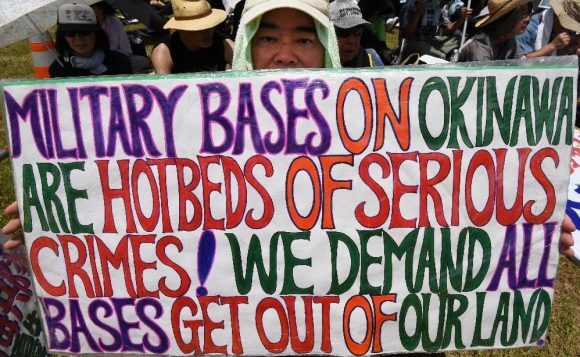 One important strategy for success is for US activists to work in cooperation with people around the world who want US military bases to be closed and for the US military to leave their country. Attendees at the conference had traveled to South Korea, Okinawa and other places to protest in solidarity with US activists. Another strategy that many in the conference urged was the need for education about US imperialism and to tie US militarism abroad with militarized police at home. Similarly, the reality of the US military focusing on black and brown countries abroad highlights a white supremacy philosophy that infects foreign policy and domestic policy. Members of the No US Foreign Bases coalition also engage in domestic efforts for racial and environmental justice. The conference attendees decided on some next steps. A national day of action against foreign military bases is being planned for February 23, the anniversary of the US seizing Guantanamo Bay, Cuba through a “perpetual lease” that began in 1903. Activists are encouraged to plan local actions. If you plan an event, contact info@popularresistance.org and we’ll post it on the events page. The demands will include closing the base and prison in Guantanamo, returning the land to Cuba and ending the US blockade. The conference also decided to hold a conference outside of the United States in one of the countries where the US has a foreign military base within the next year. People from some countries were not allowed to attend the inaugural conference this weekend. And, the coordinating committee will reach out to other peace and justice groups to select a date and place for a national mass action against US wars. This will be organized as quickly as possible because the threat of more wars is high. 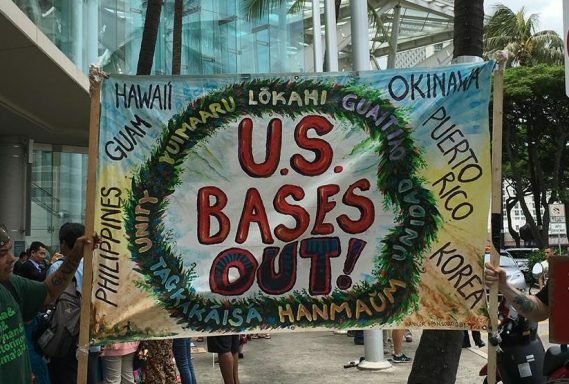 This is a key moment for the antiwar movement in the US to make itself more visible and to demand the closure of US foreign bases. In this report on living in a post-primacy world, even the Pentagon recognizes what many commentators are seeing – the US empire is fading. One great risk as the empire ends is more wars as the US tries to hang on to global hegemony. We must oppose war and work for the least damaging end of empire. Indeed, if the US becomes a cooperative member of the global community, rather than being a dominator, it would be a positive transition. Imagine how much better it would be for everyone in the world if the US collaborated on addressing the climate crisis in a serious way, obeyed international law and invested in positive programs to solve the many crises we face at home and abroad. During the Baltimore conference, World Beyond War sponsored a billboard nearby that read, “3% of US military spending could end starvation on earth.” Imagine what a peace budget could look like. The US could invest in domestic necessities including rebuilding infrastructure, a cleaner and safer public transportation system, education, housing and health care. The US could provide aid to other countries to repair the damage it has caused. Members of the US military could transition into a civilian jobs program that applies their expertise to programs of social uplift. It is imperative that as the US Empire falls, we organize for a smooth transition to a world that is better for everyone. The work of the new coalition to end US foreign military bases is a strong start. 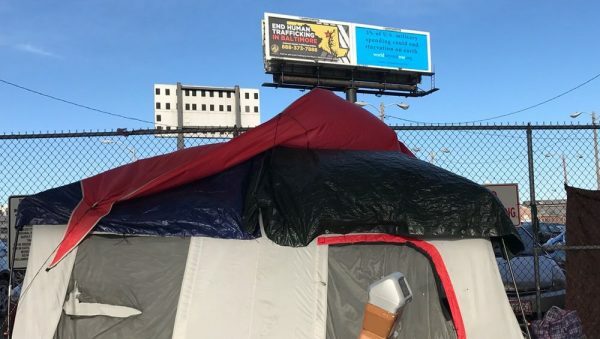 Homeless encampment in the foreground of a Baltimore, MD billboard that read, “3% of US military spending could end starvation on earth.” Source World Beyond War. Next Next post: Did Donald Trump Change His Mind on Domestic Spying?